A good week – I’ve had two more poems accepted by Les Murray for publication in ‘Quadrant’ magazine, I’ve performed in a joint fashion/poetry event in Melbourne, and I’ve had two poems selected for publication in Poetica Christi Press’s upcoming anthology ‘A Lightness of Being’. Not a bad start to 2014! Update, March 13th. The success continues – I’ve now have two poems published in ‘The Mozzie’ magazine and one in ‘Pearl’ magazine. 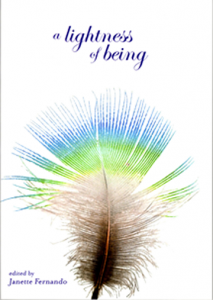 The anthology ‘A Lightness of Being’ is now available, and contains my poems ‘The Goldilocks Moment’ and ‘Yellow’.